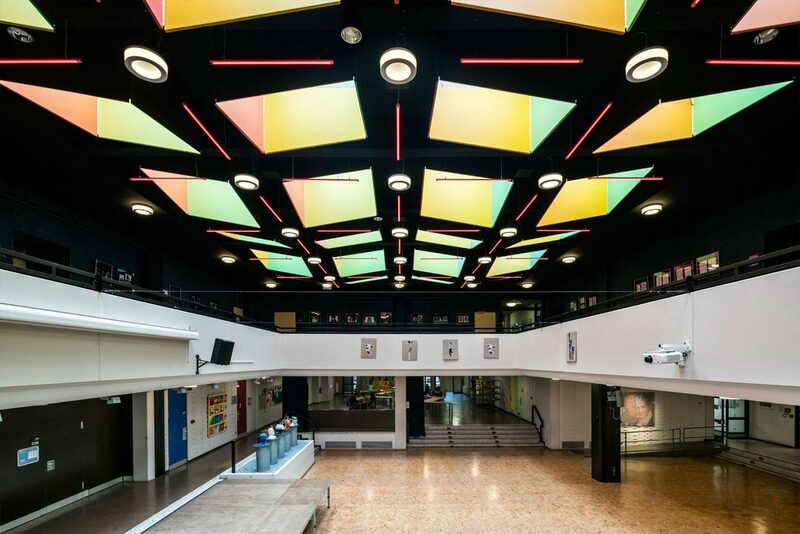 A creative, sophisticated lighting concept and maximum levels of energy efficiency need not in practice be mutually exclusive, as shown by TRILUX and its LED lighting solutions for the Humboldt Secondary School. 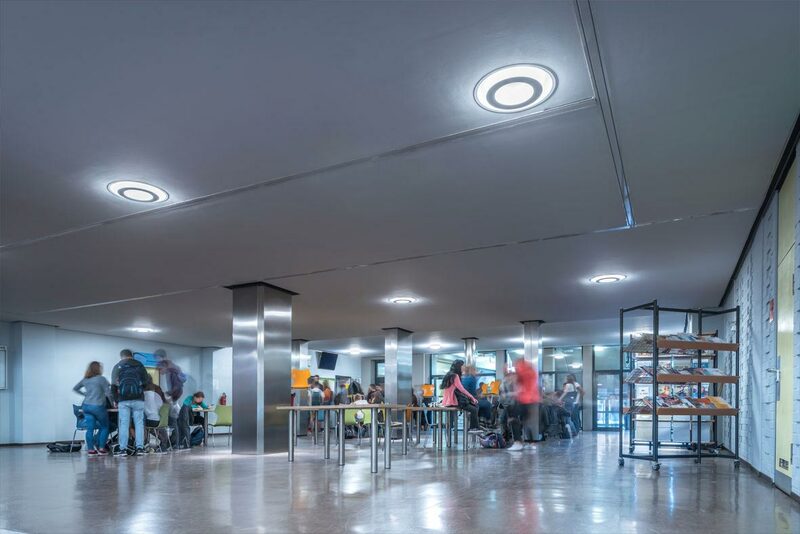 The multi-functional entrance area of the educational facility in Solingen, Germany now benefits from application-related light atmospheres and electricity consumption has been slashed by around 84 percent. A further advantage: upgrading to digital light was subsidised to the value of 30 % by Germany's Federal Ministry for the Environment, Ecological Conservation and Reactor Safety (BMUB). Entirely according to its "Simplify Your Light" brand message, TRILUX supported the city of Solingen through all phases of the subsidy application procedure. "This level of support helped us a great deal," explained Andreas Meinsma, Director of Electrical Technology in Building Management. The secondary school with 1,000 pupils uses the 900m2 entrance area as a space for hosting events and as an auditorium with a stage. School conferences also take place as well as theatrical performances and concerts. Before refurbishment it had the typical look of the 1970's and 1980's, also due to the obsolete lighting. Today though, strictly geometrical shapes and a variety of light atmospheres set the mood. The high-efficiency Polaron IQ LED was an important component of the BMUB subsidy. The light atmosphere changes according to utilisation of the multi-functional area. 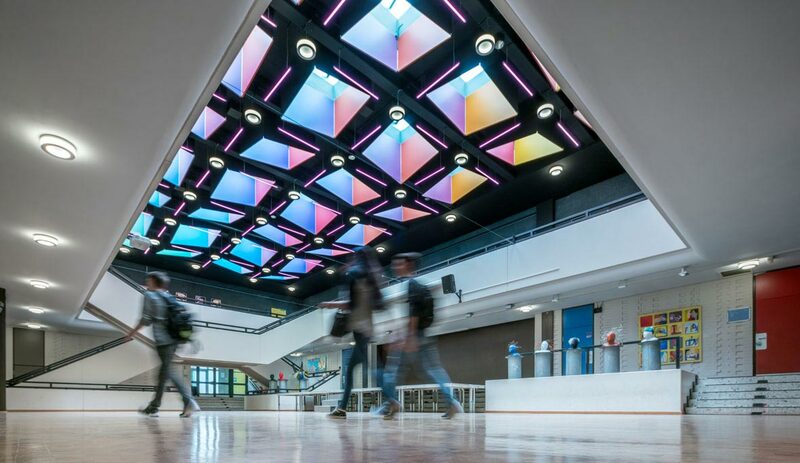 Light shafts enabling daylight to enter the space form a honeycomb structure that is supplemented with colour-changing LED strips. Where the digital light strips cross, Polaron IQ LED luminaires have been installed featuring an unmistakable design distinguished with the iF Design Award – these immediately aroused the enthusiasm of the building owners. "The design itself together with the high efficiency was an important part of our decision," continued Andreas Meinsma. The filigree ring form of the luminaire, its wide contours, finely structured surface and good light comfort due to direct light distribution are just some of product’s positive features. The luminaires are controlled via a light management system. "The control is very practical because it's visualised very well," said the building manager. The rooms are graphically depicted on the wall touch panel and on tablets and a variety of light scenes are pre-programmed which can be called up with just a few clicks. "The simple operation proved to be very interesting for all," added School Director Marko Voigt. A technician is still always on location at the school for large events, but on a smaller scale the atmosphere can also be changed in a matter of seconds. "If for example a German teacher hosts a literature event here, they can either access the preset light atmospheres in the app or manually set them themselves – that has turned out to be very popular and also looks good."